Canada Soccer has announced that the FIFA Women’s World Cup 2015™ and the FIFA U-20 Women’s World Cup 2014 supported an impressive $493.6 million in economic activity for Canada – exceeding the preliminary projections of $337 million made in February 2014 by 46%. The total initial expenditure for both competitions was $216 million, which generated $249 million in net economic activity (GDP) with $97.6 million in tax revenues supported across the country. Of the $97.6 million in tax revenues supported, $46 million accrued to the federal government, $36.7 million to the provincial governments and $14.9 million to the official host cities. The figures released today by Canada Soccer follow a study conducted using the Sport Tourism Economic Assessment Model Professional version (STEAM PRO) – an assessment tool provided by the Canadian Sport Tourism Alliance (CSTA). Canada hosted the FIFA Women’s World Cup Canada 2015 between 6 June and 5 July 2015 in six official host cities from coast to coast: Vancouver, British Columbia; Edmonton, Alberta; Winnipeg, Manitoba; Ottawa, Ontario; Montréal, Québec; and Moncton, New Brunswick. Unprecedented global television audiences and media interest, as well as record-breaking digital and social media figures ensured that the competition would be remembered as a landmark event for Canada and the development of the game. The FIFA U-20 Women’s World Cup Canada 2014 was also a success, staged from 5 to 24 August 2014 in four official host cities: Edmonton, Alberta; Toronto, Ontario; Montréal, Québec; and Moncton, New Brunswick. The FIFA Women’s World Cup Canada 2015™ set a new total attendance record (1,353,506) for a FIFA competition other than the FIFA World Cup™ and the new study has shown that it attracted thousands of out-of-town spectators. More than 84,000 visitors made one or more day trips while 174,000 visitors made an overnight visit to one of the official host cities. The study also showed that a total of 96,600 USA fans crossed the border. Spending by all of these visitors, combined with that of the 36,600 out of town visitors who were among the nearly 300,000 spectators at the FIFA U-20 World Cup Canada 2014, were reflected in the positive results of the economic impact assessment. 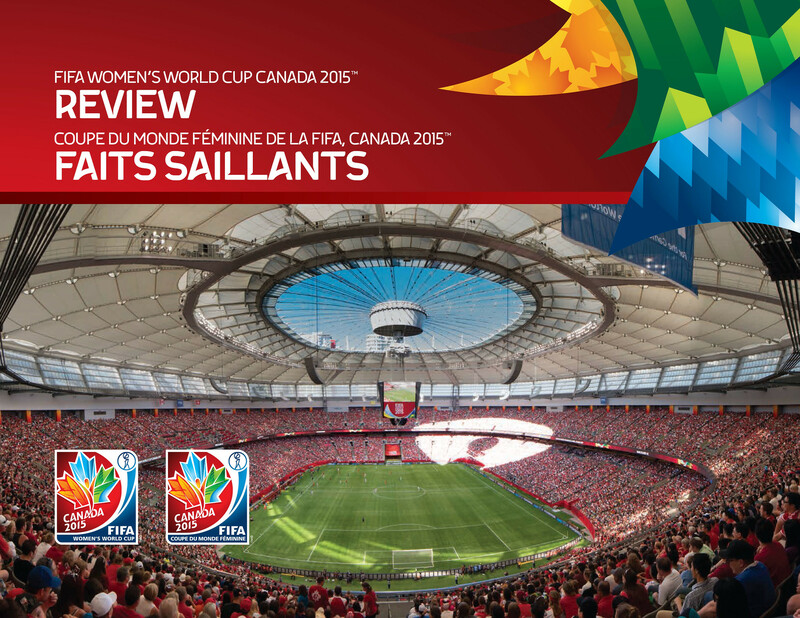 Check out the FIFA Women’s World Cup Canada 2015™ Review to relive the memories created from coast to coast in the six official host cities. The full-colour publication is available now on issuu.com/canadasoccer. The two competitions were supported by more than 2,500 volunteers, representing over 100 nationalities, who collectively contributed in excess of 153,000 hours of their time to ensure the success of the events. With the support of FIFA and Canada Soccer, the country now boasts 18 FIFA 2-Star RECOMMENDED training fields. The women’s game continues to advance thanks in large part to the highly competitive North American National Women’s Soccer League (NWSL) in addition to the domestic Regional Excel Centres (REX) that have been established. It is hoped that the more than one thousand girls aged eight to 12 who attended the seven FIFA Live Your Goals festivals in the official host cities will continue their involvement in the game and strive to reach the top level. For the first time, the sport was accessible in the school system to over 1.5 million students through the ‘Move, Think, Learn – Soccer in Focus’ school resource and curriculum supported by FIFA and Canada Soccer in conjunction with Physical and Health Education Canada. The programme will continue to benefit eight to 14 year olds through the partnership with PHE Canada. Beyond 2015, active soccer players in community clubs across the country will also benefit greatly from FIFA 11+ which is an injury prevention programme. Launched in July 2015 by FIFA and Canada Soccer together with the Public Health Agency of Canada, the program is designed for ages 14 and older with those younger having access to the same resources through the Canadian Sport for Life’s physical literacy program - Movement Preparation.